Since its inception in 1992, JOEY restaurants quickly spread into four Canadian provinces, Washington State and California. Not by repeating formulas and stereotypes, but by creating spaces that are perfectly situated to the locale and customer profile; JOEY continually develops and pushes the boundaries of casual fine dining. 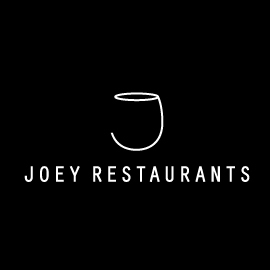 JOEY offers globally inspired food and drink, using the freshest ingredients in a modern and chic setting. Our service is individually designed to accommodate your needs. Ensuring your visit is unique and special- it?s the way we do things, at JOEY. We get it right the first time. This passion and culture is instilled in our partners, from CEO Jeff Fuller, who started his remarkable journey flipping burgers, washing dishes and sweeping the parking lot. Jeff has a strong understanding of what it takes to build a business from the ground up, and our partners bring this to life everyday! ?If there?s a secret,? he says, ?it?s hard work, unwavering commitment to the customer, and putting together a team of the very best people you can find.? From this formula, JOEY has come to be a leader in casual fine dining. Each JOEY location is unique to its area and while we may not all be the same, we have plenty in common: great food, fun times and exceptional dining experiences.